2 Punk Dogs: Zuni's new haircut & Toby too! What's this you say about the groomers? Nice that there is a cat perch off the deck. 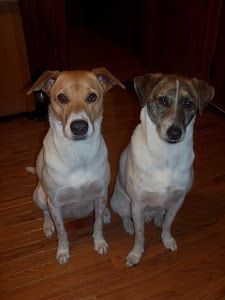 Zuni and Toby are looking for a home together; both are housebroken and up to date on shots. Zuni is spayed and Toby is neutered. Zuni will be 3 in November and Toby will be 4 in March.They are very friendly and are great with kids and other animals. Their owner needs to sell her house and move into an apartment closer to work and school. She hopes that someone with a house and yard will adopt them, as they love going outside to play. If you or anyone you know is interested in this pair of adorable adoptables, please email me at 2punkdogs@charter.net. Zuni and Toby are currently living in Massachusetts near Cape Cod, but don't let the drive stop you, their mom has a crazy commute every day! Zuni and Toby are beautiful! I hope that they find a home really soon! We'll share the info! Good luck to Zuni and Toby. Have a brilliant Sunday. They are adorable. I really hope they find a home. ps- I got your message about following my rescues blog. We added a follow button! I got it & am following! Oh, they're so cute. We hope & pray that they find a new home soon where they can stay together! We have our paws and fingers crossed that Zuni and Toby find their forever home real soon! I think she already had most of them for being a good dog!